Versatile and handy tiller for work in the home garden. 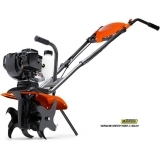 Its low weight makes this machine very easy to both operate and transport. Equipped with an easy-to-start Subaru engine and a strong worm gear transmission. A number of practical accessories are available, such as a moss rake, earthing plough, weeding tool, edger and scarifier.